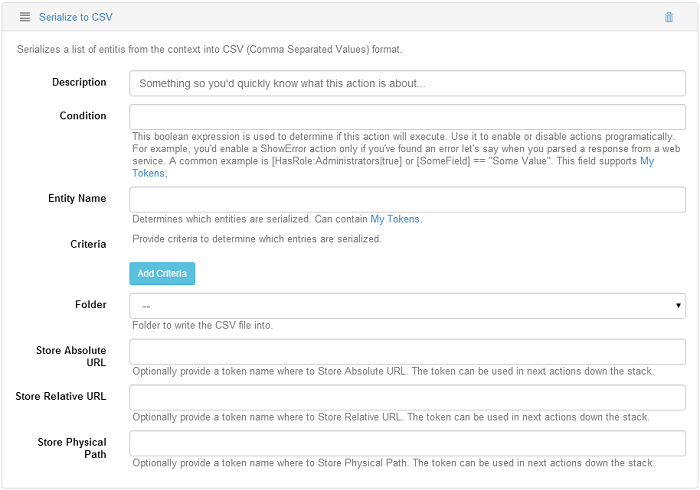 This action lets you serialize a list of entities from the context into a CSV (Comma Separated Values) format. When it’s executed, this action downloads all the items into a .csv file. On this action there are lots of options which can be let empty and just store an URL to the generated file - use the Store Absolute URL to generate the file somewhere on the disk and gives you the URL or the file path which you’ll use if you want to send an email with the file. But if you need to redirect to the file you need the URL, not the file path. If you want to email the link, then you have to use the Absolute URL but if you want to redirect, you have to use the Relative URL, it depends on the context and especially on how you use the action. As example, create a Grid button, call it export, add as action on this button the Serialize to CSV and let’s call the Relative URL, so in Store Relative URL field put the value “url” which will create a token. Add Redirect to URL action on the same button, and on the URL field put the token previously created: [url]. After saving and getting back on the page, test how this button works, click on it and you’ll see that the redirect is made to a pop up page because the browser doesn’t know to view this file, and click on it to open and take a look inside the file to see the data exported. The export can also be made on filtered data, if you need to extract only certain data. Tips for Action Grid: Manage the Grid Fields that will be serialized by using the [SpecialContext:SerializeCSV] token into a Field Condition. The most common scenario is to programatically hide an entire column and append true only into the serialization context, such as: [MyCondition] == “hide” || [SpecialContext:SerializeCSV].